I wrote the following article for the Fanzine “Aktivitat” in 1992. 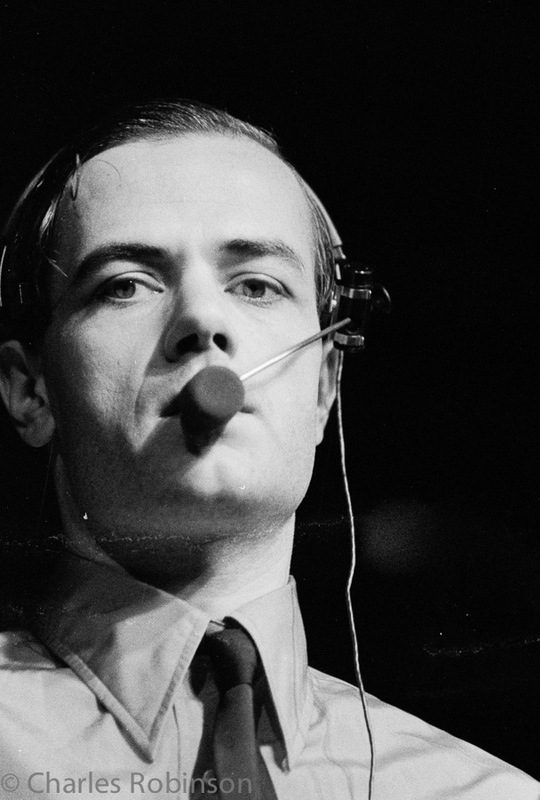 Having been to a few Kraftwerk concerts in 1981 and 1991 I was trying to reflect on the changes between the concerts with a decade in between. I have made slight changes to the text from that which was published in August 1992 to make it fit in better with this medium and this era, including the addition of pictures. The bleep, blops sounds had been going on for some time, the volume slowly rising. Was this to be the start of a new song, previously unheard? The lights went down, the audience took the roof off, the concert was about to begin. We had waited a long time for this. then that amazing computer voice introduced KRAFTWERK. As the first notes of NUMBERS started, I was gone and so too were the hundreds of people around me. the curtains were pulled back to reveal the self-illuminating KLING KLANG studio. After a few bars the group members came on stage, from our right to left, one at a time. they settled behind their podiums and brought NUMBERS to life. Four neon lights, shaped to be the names of each group member, lit the stage – Ralf, Karl, Wolfgang and Florian. Oh! Did I forget to tell you’ That was the opening of the concert on the 3rd of July 1981. Yes, it did start like that back then. So you can imagine my disappointment (yes!.. disappointment) when those curtains were pulled back in July 1991. My first reaction was “Oh, it’s the same. Couldn’t they have at least changed the set?” On closer inspection, KLING KLANG 1991 was a more streamlined version than the one I saw in 1981. the large video screens were still there though, but I did miss those neon light names. NUMBERS continued at a fast rate of knots. It was noticeable that the videos were now in sync with the music, a great improvement. As NUMBERS concluded COMPUTER WORLD started. Surprise, surprise, exactly the same as in 1981. In fact, a lot of the concert in 1991 reflected the running order of the 1981 concerts. Some tracks were dropped (notably NEON LIGHTS, the HALL OF MIRRORS and SHOWROOM DUMMIES) and of course others added (though not many!) I will not start to go through each one of these and scrutinise them. However, I will pick on some of the major differences. First thing though, I cannot go on without mentioning the common factor of the ‘power’ of the music. Of course the mixes of the tracks varied a great deal across the decade, but the ‘soul’ of the music was so forceful when I heard it being played live that I’m sure the 1991 concerts will remain as strong with me 10 years from now as those from 1981 are to this day (they do!). I cannot describe the ‘feeling’ I had, but if you were at a concert I’m sure that you will understand. I cannot remember much of the videos from 1981. I remember whilst TRANS-EUROPE EXPRESS was playing, the video showed the train tracks as seen from the front of a train, as also used in 1991. the MODEL, in 1981 had the now well-known video playing while the ROBOTS featured the original 1978 promo. The pace of the concerts in 1981 varied a lot more than those in 1991. I think I can safely say that in 1991 KRAFTWERK were in 5th gear all the way throughout the show. However, in 1981 I can remember that about half way through, just after RADIOACTIVITY, everything slowed down, as KRAFTWERK introduced OHM SWEET OHM by using electronic voices to proclaim ‘Peace on Earth’ in several languages. When OHM SWEET OHM did arrive it was very slow and did not speed up as on the LP. AUTOBAHN, back in 1981, was played at a faster speed than that of the original. It was amazing! This track also serves as another example of one of the major differences that I noticed when watching the two concerts. 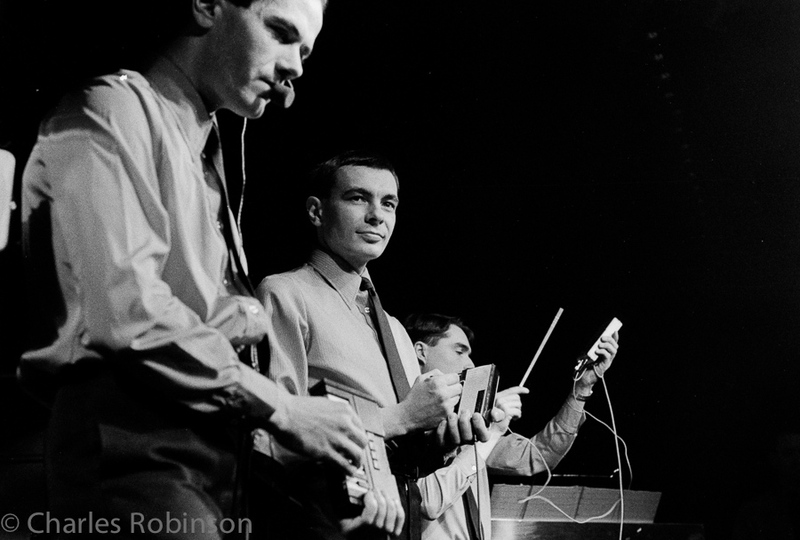 KRAFTWERK in 1981 were far more interactive with their KLING KLANG machine than they are now. During AUTOBAHN both Karl and Wolfgang left their main podiums and played ‘drums’ with ‘sticks’. Yes, we did see some of that last year but not for five minute solos. By the way, you know that video KRAFTWERK use for the MODEL; when they show the live portions, you will notice Karl and Wolfgang playing these drum kits I have just mentioned. I am sure that these live portions of the MODEL video is taken from AUTOBAHN when this drumming piece was going on. Florian had a much bigger part on the vocals side back in 1981. Whenever there was an electronic voice (well, in most cases anyway), Florian was the provider of it. Using a vocoder, he would tend to ‘sing’ along with Ralf. Notable use of this was during AUTOBAHN and the ROBOTS, amongst others. The encores were the same, except for the last one. (1981 – IT’S MORE FUN TO COMPUTE, 1991 – MUSIQUE NON STOP.) However, the use of visuals here has changed. 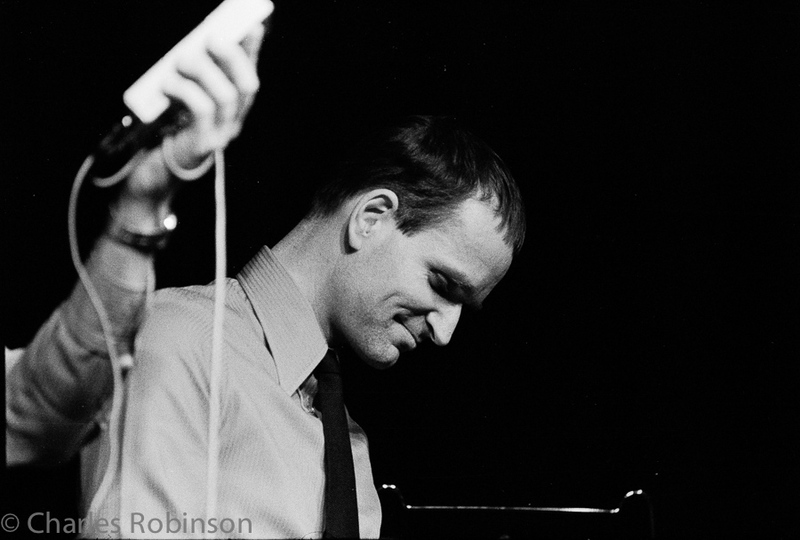 TRANS-EUROPE EXPRESS had just finished and the curtains were pulled across. (the same in both decades!) 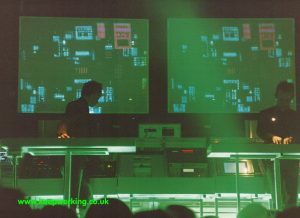 After a while the curtains were pulled back to show KRAFTWERK playing POCKET CALCULATOR just feet away from the crowd. Here the similarity stops. the instruments differed greatly. Ralf played a miniature keyboard in both 1981 and 1991. 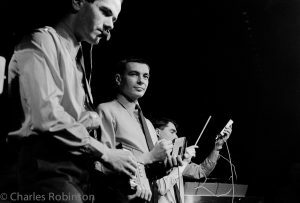 However, in 1991 the remainder of KRAFTWERK all seemed to be playing the same type of instrument. 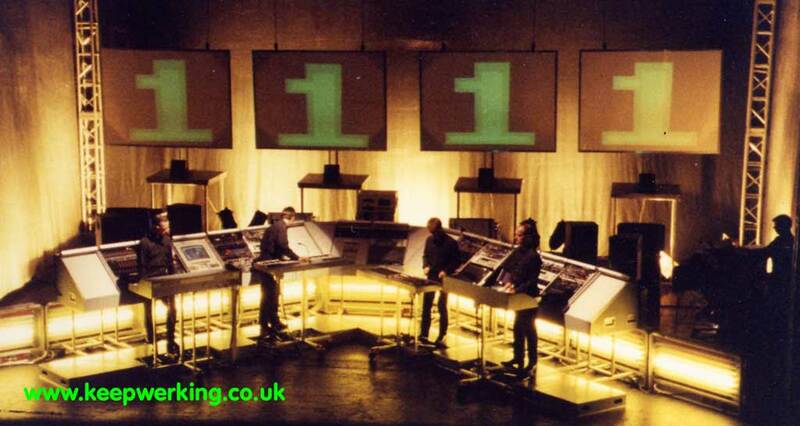 I think that each of these were controllers, to sequencers, to play rhythm, percussion and ‘bleeps and blops’. When a particular sequence was required to be played, a switch was pressed. However, back in 1981 all was different; things were being played live. Karl had a Rolf Harris type Stylophone and was tapping out the rhythm. (If you do not know what a Stylophone is then I am older than I thought!) Wolfgang had a little two drum pad set in his hand on which he played the percussion, with an electronic stick and Florian had a little box to make noises with, at the press of a button. The ROBOTS was the next encore. We all can remember what happened in 1991. Fantastic stuff! When the curtains were first pulled back I thought something had gone wrong-where were the robots? then the video started to play and I thought the robots were going to trundle on the stage at any time. After waiting several minutes though all was revealed. Back in 1981 when the curtains were pulled, the music was cranking up and getting faster and faster. 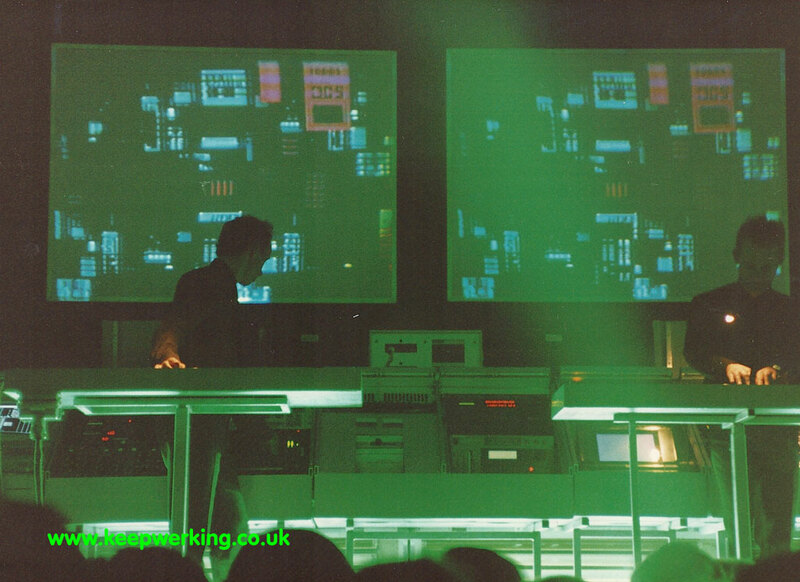 To the time of the music strobe lights were flashing brightly at KRAFTWERK. Through this flashing I could make out that there were now eight ‘people’ on stage. Four humans and four motionless dummies. However, the effect of those flashing lights was…electric. As I am running out of space, I will do a quick summary. As I had seen KRAFTWERK before, back in 1981, I went into the 1991 concerts expecting to see something to top what I had seen a decade before. Frankly, I did not. I would rate them at the same level as that of the 1981 concerts. Both sets of concerts had their great moments that I am sure will be remembered for a long time. Both were very similar in content and format. Both were fantastic and I am pleased that I was a part of the 1981 and 1991 tours. I remember after the shows in 1981 that I would probably not see a concert to exceed them. In 1991 I saw those shows matched with different performances and mixes of my favourite tunes. 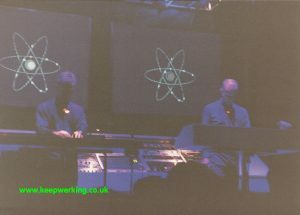 My only disappointment with the 1991 shows was the fact that KRAFTWERK appeared to be more automated. I would have liked to see a lot more ‘inter-activity’. Yes, there was a lot to be seen but not half as much as in the 1981 gigs. I was left with the impression that the MAN MACHINE was turning into the MACHINE MAN! Have you been to more than one Kraftwerk concert? How far apart in time were they? How did they compare? Please let me know. Alternatively leave a comment below.